But apparently, the DCCC didn't get the memo that voters aren't happy about selling out their interests to the health care, insurance, oil, gas, and coal lobbies. And then, purely by chance we're sure, DCCC chair Cheri Bustos went on the record saying that the "price tag for Medicare for all is a little scary." Meanwhile, former members of Congress turned pharma lobbyists have raised $10,000s on behalf of the DCCC. "We're launching The Blacklist to fight back and provide potential primary challengers with a database of go-to vendors, organizations, and consultants who will continue to support efforts to usher in a new generation of leaders into the Democratic Party." "While there are people who have a large number of Twitter followers, what's important is that we have large numbers of votes on the floor of the House," Pelosi said to USA Today, appearing to make reference to the nearly four million followers of Rep. Ocasio-Cortez. 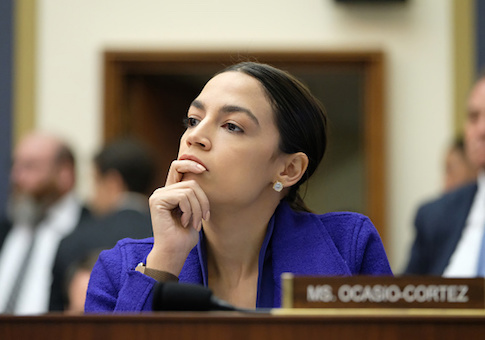 "It's similar to what we, as Republicans, dealt with when we were in the majority," former Republican Rep. Ryan Costello told USA Today in the same article in which Pelosi mentioned Ocasio-Cotez's Twitter followers. "You have an ascendant left that is very angry, very blunt, frankly a little irresponsible in the things they say. And the base soaks it up." This entry was posted in Politics and tagged Alexandria Ocasio-Cortez, Democrats, Nancy Pelosi. Bookmark the permalink.